Alright, so this is the 1000th review of Suzanne Collins' book The Hunger Games I'm sure, but having just finished it last night I had to write about it. I put off reading The Hunger Games because everyone was gushing about it and I tend to stay away from those books. Plus, the names of the characters really turned me off: Katniss? Peeta? Come on. Anyway, I nearly fell under the Twitter pressure when Jill wrote me a song and then I knew I had to read it. If you don't already know, the plot of The Hunger Games is set in the future where the remains of North America is divided up into Districts and The Capitol. Katniss lives in the poorest District, 12, where she lives a hand to mouth existence providing for her mother and sister with her mad hunting skills. Long ago, the Districts made war with the wealthy Capitol and lost. As a punishment, every year each District must provide to two young Tributes to fight to the death in a reality show called The Hunger Games. After a stunning event called the reaping (reminiscent of Shirley Jackson's The Lottery), Katniss and a boy she goes to school with, Peeta, are chosen for the Games. 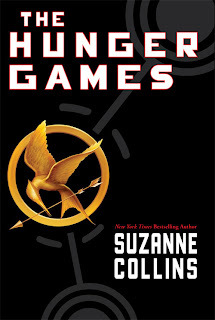 For the rest of the book, we are driven to read the dramatic events of The Hunger Games through our young heroine's eyes. Can she survive? Will she kill sweet natured Peeta to win? I couldn't put down The Hunger Games. It had me from the first page. Katniss narrates the grim story through gritted teeth. She has a hard edge after spending years trying to keep herself and her family from starvation and it shows. The pacing is incredible. You barely have time to take a breath from chapter to chapter. There are twists, surprises and heartbreaking moments. It's also terribly violent. After the first book in the series, I'm totally Team Peeta (sorry Jill). That could of course change when I read Catching Fire and see more of Gale, Katniss's other love interest. Right now though, I love Peeta's kindness and vulnerability. How very sweet that he admired her from afar for all those years. Say it with me, "Awwwww." There were times I felt he was too stupid to live and could relate to Katniss's frustration too. Now Katniss. I loved her when she was The Hero; she was brave, she was cunning, she was amazing. I did have a problem with her when she was with Peeta. I was thinking, "This guys is pouring his heart to you and YOU JUST DON'T GET IT!" This made me crazy! Maybe in the next book she'll borrow a feeling and have an emotion of some kind. If you like dystopian novel, then I think you should give The Hunger Games a try. My GOODNESS, I really need to read this book! I finally got someone to promise to lend me her copy of The Help and I'm currently reading Graceling, so at least I'm making movement on my "I'm the last person to ever read this book" list. But seriously, I'm so out of the loop on all these things! I have wanted to read this, but have held off. I am moving it to the top of my wish list...it sounds great! Thanks for the review. maybe when all three come out and people are still raving about how great it is then I'll read it and love it too. I knew you would be Team Peeta! Na-na-na-na-na-na, Team Gale! I finally got around to listening to this - and couldn't stop! Can't wait to get my hands on the second one! So happy you joined the party and even liked it! :) Looking forward to your Catching Fire thoughts. What?!? That's it...no more songs for you. Jill- Sorry, the heart wants what the heart wants. Suey- I'm trying to pace myself but really want to read it. Trisha- I checked this one out of the library. Rebecca- If the last is as good as the first, it will be an excellent series. Missy- Hope you enjoy it! Aarti- I am too. It took some convincing to get me to read it. I haven't read this yet, but my husband has and he's not much of a reader! Glad you liked it so much. I too avoided this because of the hype, caved, loved it and am totally team Peeta! :-) Just ordered the second book, can't wait! I am completely Team Peeta too - I kept wishing Katniss would return his affections throughout the book. I just loved him! Looking forward to what you think of Catching Fire. Yours may be the 1000th review I've read about The Hunger Games but I've yet to read it myself, for pretty much the same reasons you stated. HOWEVER, after reading two posts about this book just this morning, I've decided to bite the bullet and now have a library copy checked out to myself. I've got a few books in front of it so I may not be the 1001th person to review it but hopefuly it will be sometime soon! My daughter loved the book and is eager to see the movie. Says she liked it a lot more than Twilight which is about the highest praise a teen girl can give. She really wants me to read it but I've been busy with another. "Maybe in the next book she'll borrow a feeling and have an emotion of some kind." Brahahahah!! That was great and exactly how I felt. I'm on Team Peeta all the way, too. I mean really, how could it be otherwise. (Sorry Team Gale, but you're crazy). I haven't read "Catching Fire" yet because I'm waiting to get a little closer to Book 3 which is due out in September. Glad you finally caved and liked it though. It's one of those rare books that actually lives up to its hype. This book was so good!! I'm glad you enjoyed it. And yes, Totally Team Peeta!! I thought Catching Fire was just as good. You must read it soon!! Cathy- You have to read it now that he has. Then you can do a joint review! Joanna- I have to get CF too. Lesley- Once you get it, you'll read it in a day! JS- If I read CF, it will be a long wait to Sept. Maybe I'll wait a few months. Stephanie-I'm glad you thin CF is just as good. Stephen King wrote a review of The Hunger Games. He enjoyed it also, but couldn't stand the name Katniss! I also read book two Catching Fire and thought it was great! LOL! I love that you tell Katniss to buy a clue, that's awesome. Speaking of awesomeness I'm glad you had the chance to read this book. I know you already know this but it's one of my favorites from this past year. Do pick up Catching Fire and read the second it's totally worth it as well. "borrow a feeling and have an emotion' Love it! This is one of those hard-to-put-down books! My husband, who isn't really a reader, absolutely loved it along with Catching Fire. He keeps asking me when the next one is being released, and he NEVER does that with books.